CHANDIGARH, OCT 2 : Unseeded and qualifier Vishvesh Sinha of Maharashtra and eighth seed Mehak of Chandigarh annexed the boys Under-18 and girls Under-18 singles titles, respectively, in the AITA Championship Series Tennis Tournament at the Sector 10 Tennis Stadium here today. Vishversh easily defeated qualifier Mandeep Gill of Chandigarh in the boys under-18 final in straight sets. Hitting his strokes fluently, Vishvesh won the first set by dropping just one game at 6-1. Mandeep Gill put up a good fight in the second set but Vishvesh clinched it at 6-4 for the title. Mehak shattered the hopes of second seed Simriti Joon of Delhi as the Chandigarh girl recorded win in straight sets 6-3, 6-4 emerge winner in the girls under-18 singles final. Second seed and CLTA trainee Kamal Kishore Maderna, representing Rajasthan, caused the biggest upset as he toppled top seed Nischay Rawal in straight sets 6-2, 6-3 in the boys Under-14 singles final. Unseeded Rinisha of Delhi went down fighting to top seed Bhavika Wadhawan of Chandigarh in the girls under-14 singles final. Bhavika won the first set at 6-2. Rinisha rallied to win the second set at 6-4 to level the score 1-1. In the decider, both players fought well but Bhavia maintained her cool to win at 6-4. Results: Boys-Under-14 (semi-finals): Kamal Kishore Maderna bt Tarun Nath 3-6, 6-0, 6-1, Nischay Rawal bt Ranjit Singh 6-3, 6-4. Final: Kamal Kishore Maderna bt Nischay Rawal 6-2, 6-3. Girls-Under-14 (semi-finals): Bhavika Wadhawan bt Anukriti 6-1, 6-3, 2 Rinisha bt Lavanya 6-1, 6-1. Final: Bhavika Wadhawan bt Rinisha 6-2, 4-6, 6-4. Boys-Under-18 (semi-finals): Mandeep Gill bt Ajay Yadav bt 6-2, 6-3, Vishwesh Sinha bt Nadella 7-6, 6-3. Final: Vishvesh Sinha bt Mandeep Gill 6-1, 6-4. 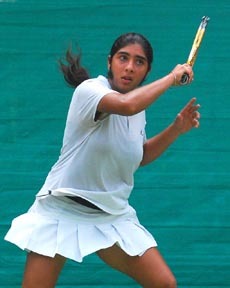 Girls-Under-18 (semi-finals): Mehak bt Arzoo Malik 6-2, 6-1, Samriti Joon bt Ankita Bhatia 6-4, 4-6, 6-3. Final: Mehak bt Samriti Joon 6-3, 6-4.